Not all kids reptile show entertainment is the same! Some providers have just a few reptiles, while others may bring a great number and types of different species. Within Melbourne and the rest of Victoria only the snake man's displays bring all kinds of reptile from the region. This includes all the venomous ones and also with complete safety. This is guaranteed. The only reptile show in Melbourne and Victoria that takes safety seriously are the snake man's and those done by his magnificent team of helpers. This is because only the snake man's has the expertise to have vet certified sugically devenomized deadly snakes that guarantee the safety of both handlers and audience. More significantly, these are the only venomous snake shows in Melbourne that do not engage in the brutally cruel stick handling of snakes for public entertainment. Instead all snakes are gently picked and handled by hand, with care and respect. With deadly species, this is a feat normally reserved for the brave and foolhardy. However it is in this case allowable and safe due to the fact that the snakes have had their venom glands safely removed. The snakes are treated with care and respond in kind. Unlike the stressed-out and highly strung snakes seen in displays of imitators, the snake man's shows have snakes that are well-adjusted and quite happy being handled. As it happens, all the reptiles at the snake man's snake show and reptile display actually enjoy being handled as it gives them the opportunity to get warmth off the hands of the handler. On hot days the reverse applies as the handler sweats and so is cooler than a lot of other surfaces. A really good reptile show should not just have a large range of different and healthy well-adjusted snakes, crocodiles, lizards, turtles and frogs, but it should also give a proper education about the most important things to do with the animals. An animal show that doesn't do this really isn't worth getting. The snake man travels with his wildlife to all places including everywhere in Australia as well as overseas. However being based in Melbourne, Victoria, most of his work is in that region. The snake man's shows have an unrivalled perfect safety record, spanning more than 32 years in the wildlife education business, making them the most demanded reptile show in Australia. In recent years there have been several incidents involving members of the public getting life-threatening bites at venomous snake displays organised by other less experienced companies. With the snake man's market-leading shows, ther is absolutely no risk of this at all. The worst possible bite outcome is nothing more than a pin prick. 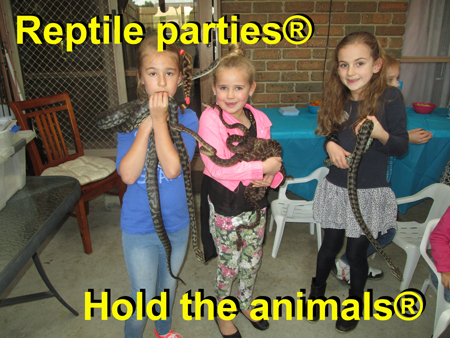 Being the best reptile displays in Australia, the snake man's exhibits are sought after for mobile school incursions, corporate team building, business luncheons, school holiday programs, kids reptile parties, birthday party entertainment and lots more. The snake man of Melbourne is always very busy and so if you are thinking of getting a reptile awareness session or display at your place, make sure you secure your booking first before letting your friends know who is coming as the guest or guests of honour.